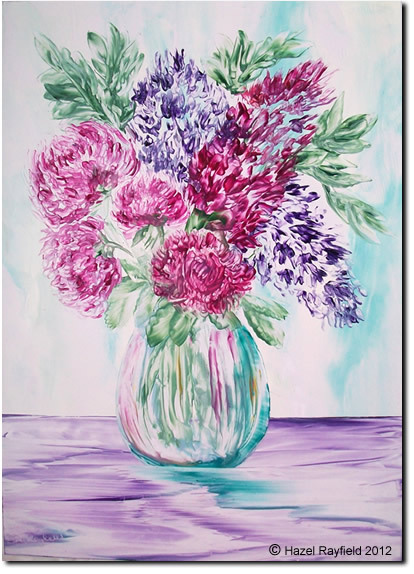 Painting Flowers – There’s nothing better! One of my favorite subjects to paint are flowers, you only have to look at my website and gallery to see that flowers play a part in most of my paintings, they may be the main subject or part of a landscape or held by a lady in a picture maybe. This latest painting has a vase of flowers, styled like Chrysanthemums and Lilac and painted in pink and purple tones of encaustic wax. I come from a family of flower lovers, my Mum loved flowers both for the garden and as cut flowers. Her favorite cut flowers included Freesia and Chrysanthemums, Mum liked the large single stem variety of Chrysanthemum and there was always a bunch of these ball like blooms in our home when they were in season, looking majestic with their deep gold, red and pink tones. Roses are also a popular flower for our family, Mum loved them as did her Mum, who had many in her garden, I remember as a small child going to the rose fields in Yorkshire when visiting our Grandparents and spending hours walking through fields of roses, loving every moment. The scent was amazing and the array of coloured roses has stuck with me to this day. Memories are very powerful I feel, this family love of flowers, is part of my passion for painting floral subjects, my sister reminded me when I checked with her what her favorite flower was this morning. “Pinks – I like them because they smell nice and remind me of the flowers in the garden when I was a little girl”. She also reminded me of a family holiday to Devon, in the 70’s (we were very young!) when we had a day out and looked at rhododendrons for what seemed like ages, at the time we were so bored! and now I could sit for hours just admiring and sketching them. I love to paint many flowers, and there is nothing better than having a few hours in my studio painting and loosing myself working with the wax. I also love to have real flowers and flowering plants in my home and garden. My own favorites are also Chrysanthemums I prefer spider varieties, and of course roses are high on my list, together with Gerbera, Lavender, Sunflowers, Poppies …… well lots really! Art In Wax has lots more paintings of flowers and this painting is also in the shop for sale and a great way to bring the outside in with flowers for all time. What do flowers mean to you? What are your favourite flowers? do they bring back memories?